(Bloomberg) -- A popular former Israeli military chief, breaking weeks of silence on his political views, set himself up as the “anti-Bibi” as he seeks to deny Prime Minister Benjamin Netanyahu a history-making fifth term. Benny Gantz recited a litany of failures he identified in the country’s leadership, ranging from the corruption allegations against the prime minister to the deep polarization in Israeli society and the high cost of housing. His view of Israel’s future borders hewed firmly to mainstream concepts rejected by the Palestinians, and offered no sweeping concessions that might revive the peace process. A poll released Wednesday, a day after Gantz’s speech, showed his party jumping to 19 seats in the 120 seat-Knesset, a gain from his previous level around 15 seats. That puts him in second place, behind Netanyahu’s 29 seats in the poll, a slight decline. Netanyahu is fighting for his political life as he seeks a new term in April 9 parliamentary elections that would make him Israel’s longest-serving prime minister. Although polls show him cruising to another victory, his political survival could be jeopardized if Attorney General Avihai Mandelblit decides to indict him. Netanyahu has denied wrongdoing, saying he’s the victim of a witch hunt by left-wing opponents. He says he’d continue to govern even if charged, and he’s not obligated to resign unless convicted. Mandelblit, who is currently reviewing the case files, is expected to announce his intentions in the next few weeks. Gantz didn’t explicitly rule out serving in a Netanyahu-run government -- unless the prime minister is indicted. "The idea that a prime minister can rule after an indictment is served against him is ridiculous to me," he said. Polls show Gantz as the opposition figure most likely to deliver a serious contest at a time when many Israelis are despairing over the country’s politics and its future in a volatile region. With just over two months until the vote, it’s not clear if the opposition can muster enough strength to overpower Netanyahu’s coalition of nationalist and religious parties. 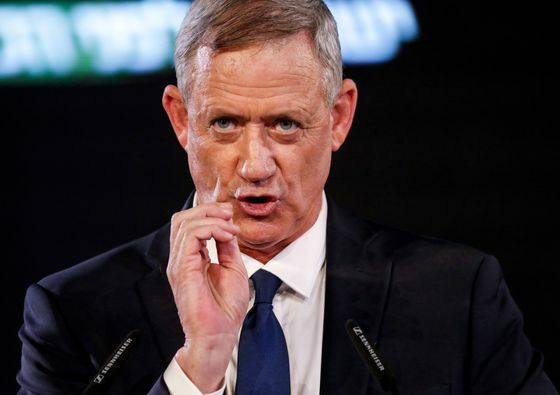 Gantz’s military credentials -- he spent 38 years in the army before retiring in 2015 -- are a top political asset against Netanyahu, who built his career as a defender of Israel’s security. The ex-general also has a reputation for clean hands and affability. Security issues generally are a deciding factor when Israelis vote, and Gantz didn’t stray from the consensus. He pledged to retain Israel’s West Bank settlement blocs, keep Jerusalem united under Israeli rule, hold on to the Jordan Rift Valley and maintain control of the Golan Heights, captured from Syria in the 1967 Middle East war. He never mentioned a Palestinian state, and vowed not to “tolerate a threat to Israeli sovereignty” from Iran. Gantz told supporters Tuesday he’s interested in forming political alliances that could bolster the party. Before his speech, Gantz agreed to run on a joint ticket with Moshe Ya’alon, another ex-military chief who served as defense minister under Netanyahu until an acrimonious parting. "Benny, we’re here to win,” Ya’alon said as he joined Gantz onstage. Despite Gantz’s decidedly mainstream approach, Netanyahu and his allies branded the ex-military chief with a label they consider the kiss of death. “Whoever says he’s not right and not left -- is left,” the prime minister wrote on his Facebook page.